The new print advertisement which shows the Emx-525 as ‘The Best Balanced Bike in the World’. As you all know by now, the stiffness and stability of the Emx-525 is way ahead of the competition. This week Eddy Merkcx has launched the EMX-525 campaign. Check out the first web commercial of the showpiece of the 2013 Eddy Merckx Cycles collection right below. R&D engineer Dave and test rider Jeroen went for a ride in beautiful SalzburgerLand (Austria) to enlighten the technical innovations of the new Emx-525. Don’t forget to check out the guest appearance of the cannibal himself at the end of the clip! Cratoni C-Bolt Helmets Are Here!!! The C-Bolt from Cratoni is a helmet that punches well above its price tag. Styling is quirky, with its little duck tail at the rear, but we became quite fond of it, and in the black colour option (white and red also available) it isn’t going to be a talking point on the club run. Weight is a feathery 200g, and though you might worry that it could feel flimsy and ineffective, in reality this German design has the assured feeling that you get from slamming shut a heavy Mercedes car door. Solid, Safe, Secure. The full in-mold construction extends under the rim, a feature we like as it defends the soft EPS underbelly of the helmet from day-to-day damage. The build quality is high and it feels like a real option to the likes of Giro, Bell and Specialized, right down to the layout of the retention device, the ‘anatomic fitting system’ dial. The inner shape of the helmet will fit rounder heads best. The 21 vents sucked autumn air effectively and what sweat we generated was handled well by the removable Coolmax liner pads. The only niggle we had was with the Cratoni logo – stick-on letters which were hanging off the helmet right out of the box. Cratoni C-Bolt scores first place in TOUR Magazine current helmet test June 2011. With an overall result of 1.3, Cratoni C-Bolt is the top scorer among 14 tested helmet models. Cratoni are particularly proud of the grades regarding excellent ventilation as the C-Bolt sets the benchmark concerning actual evaporation. Overall Result: 1.3 and therefore top-scorer/winner in TOUR-magazine issue June 2011. One month after, C-Bolt strikes again with an overall result of 1.8 in RennRad Magazine. 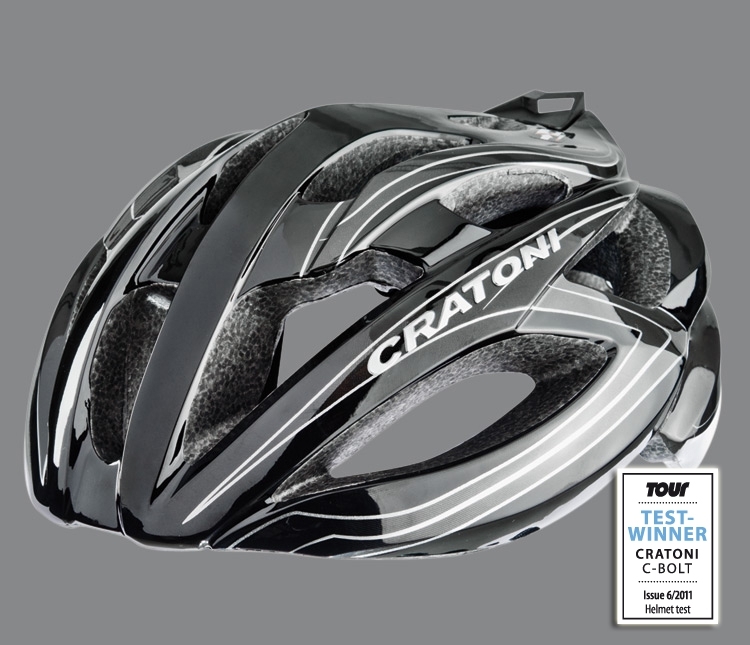 Another first-class test result for Cratoni new roadbike helmet C-Bolt. With an overall result of 1.8, RennRad-Magazine lists the C-Bolt helmet among the best. Quote: “Lightwight does not have to be expensive whicht the C-Bolt demonstrates. First class finish and optimal fit”. The roadbike-edition of the C-Tracer first and foremost appeals to ambitious cyclists searching for optimal price-performance ratio. The C-Bolt comes with a sophisticated ventilation system including enormous vents and a smooth running one-hand adjustment system. Additionally breathable Coolmax® pads round up the perfect cycling experience. The C-Bolt is also available as mountain bike-version called C-Tracer. Inmold: Inmold construction. Inner and Outer-shell are inseparably jointed for a gapless connection between both sides. This enables an extremely safe and lightweight helmet structure. Anatomic Fitting System: Lightweight size adjustment system with foamed fixation. Optional Einsetzbares Netzpad: Optional insertable netpad. Cratoni Road Helmets are here! As a specialist with years of experience, Cratoni are aware of their responsibility. Their deeply rooted enthusiasm for sport forms the basis for a philosophy which focuses on passion, adventure and having fun on the way. As a leading cycling helmet manufacturer, their mission is to assist outdoor sport enthusiasts to achieve their goals, and to look for new challenges every day in order to raise the sport to a new level together with professional athletes, experts and motivated sportspeople. Here’s a cool video on one of Cratoni road helmet – Terron. Watch it to believe how good it can be! The ultimate road-helmet for cycling enthusiasts. The updated carbo wing technology and the integrated carbon and fibreglass compound segments provide a superstrong yet lightweight helmet structure and allow the oversized vents. The advanced inner vent architecture maximizes the flow of air. Now it is time to experience the new benchmark in competition helmets. Carbo Wing: Integrated carbon frame, this enables an extremely lacy structury with outstanding ventilation, high stability and security. Optional Einsetzbares Netzpad: Optimal insertable netpad. The Ceron is the choice of many pro riders who take it seriously. The new 2011 edition offers a newly designed inner shell for perfect fit and comfort essential for long distance rides. Approved by the tests of various bike magazines the ventilation performance of this high tech helmet is outstanding. The carbo wing technology guarantees the ultra strong structure resulting in reliable impact resistance. Soft Shock: Special EPSX liner. The special structure of the EPS liner optimizes the shock absorbing abilities in case of an impact. Evolution Fit System: 270˚ exchangeable adaptor fitted sized adjustment system with comfortable elastic pretension. Carbo Wing: Integrated carbon frame, this enables an extremely lacy structure with outstanding ventilation, high stability and security. Impact Carcass: Reinforcement of the complete helmet structure which covers the whole helmet. Additional safety for high speed.